Filters should remain switched on in winter. Take care that no water will be pumped from the bottom or the deeper area, with a view to cooling down of the pond water. Now the pond has entered into a period of rest. Plant growth has stopped and fish hide near the bottom. Your pond can do with less attention. Proceed in a preventive way in order to avoid that the pond water will be freezing over. 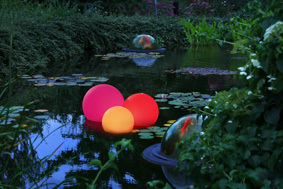 The best and most beautiful method is to hang one or more aeration stones in the pond water. The rising air bubbles will not only clear your pond water of ice in that area, they will also dissipate harmful gasses whereas oxygen will be supplied. An alternative is a pond heater. The pond heater causes that the pond doesn’t become frozen. Any snow on the ice could provide a beautiful insulating layer, however, yet it is recommended to remove part of the snow very carefully, even if your fish are resting. A single ray of sunshine in the dark winter period works. For example for vitamin D production in fish.